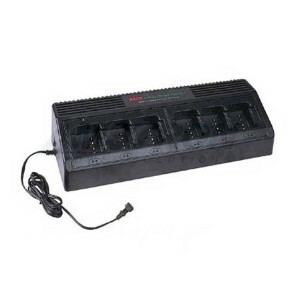 6 Bank Two-Way battery charger, keeps your batteries charged and ready for use. The 6 Bank two-way rapid charger is designed for use with Motorola, Kenwood, Icom, and Uniden battery packs, and this charger is designed to charge NiCD, NiMH and Li-Ion battery packs. The drop-in charger inserts are interchangeable between one and six station units and can be changed in seconds without accessing the inside of the unit. This six bank charger can use any combination of available inserts simultaneously. You must specify in the Checkout Comments area during checkout, what kind of radios you have, so that we can include the proper inserts!